In this book, Robert Harbison offers a novel interpretation of what architectural theory might look like. The title is an echo of Wallace Stevens's "Thirteen Ways of Looking at a Blackbird." 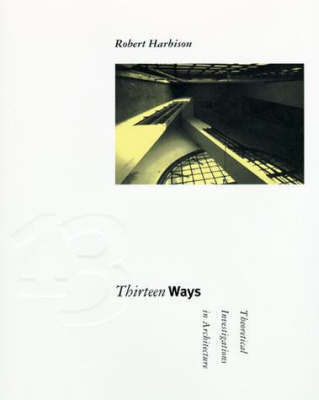 Like the poem, Harbison's work is a composite structure built of oblique meanings and astonishing shifts that add up to an engaging portrait-in this case a portrait of architecture in which use, symbol, and metaphor coexist.The chapter titles indicate Harbison's themes, all of which bear parallel, implied, or tangential relations to architecture: Sculpture, Machines, the Body, Landscape, Models, Ideas, Politics, the Sacred, Subjectivity, and Memory. The journey through the chapters is roughly a journey from the physical to the metaphysical, a journey that is at once poetic, technical, and philosophical. Harbison examines his subjects with as few preconceptions as possible, taking familiar concepts and stripping away all associations until they become strange, producing ideas that are refreshing and new for architecture. The book straddles the ground between the intellect and the senses, leading the reader beyond the realm of theory and practice into the universe of the imagination, where "space" is experienced as something touched, seen, and thought. Spaces Speak, Are You Listening?